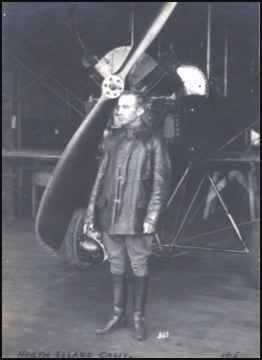 The commander of Payne Field was Lt. Col. Jack W. Heard. Heard (right) was a career army officer, a West Point graduate (class of 1910), and the son of Medal of Honor John W. Heard, a native of Woodstock, Mississippi. His father (Jack’s grandfather) fought in a Mississippi cavalry unit with Nathan Bedford Forrest during the Civil War, so Col. Heard’s roots both in the army and in Mississippi were deep. After graduation from West Point, Heard was assigned to the 7th Cavalry (George Custer’s old regiment) and was sent to the Philippines. 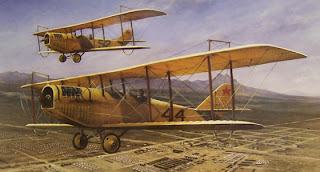 It was here that Heard first became interested in the new phenomenon of flying, and after several applications for transfer he was finally approved for the Aviation Section of the Signal Corps and earned his pilot’s certificate. 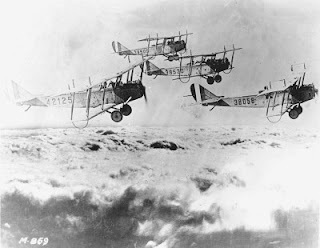 Quickly rising in the ranks of the Air Corps, he went on to command three training bases during the First World War: Kelly Field in Texas, Scott Field in Illinois, and Payne Field. As training commenced at Payne Field, several fatal accidents occurred, four within the first few months after the base was established. Among the casualties was a young flier named Clarke Owen of Lansing, Michigan, whose plane crashed from a height of 100 feet near Muldon (located in Monroe County). A companion was also seriously injured in the crash. As dangerous as flying was, disease was also a great concern for the men at Payne Field. In June, 1918, the U.S. Public Health Service reported that the airfield was located in “one of the worst malaria belts of the United States” and that local physicians claimed that 75% of the region’s population were infected with the disease. It was pneumonia, however, which claimed the life of James Madison Allen (left), a member of the 239th Aero Squadron. The thirty-year-old sergeant died on January 31, 1919, in the hospital at Camp Shelby, where he had been sent to recover. He is buried in the Woodlawn Cemetery in Sharon, Tennessee. A LETTER FROM THE AIR. From a C.O. to a Boy Who Could Not Be a Soldier. Attached, I am forwarding you a copy of a letter received by the commanding officer of this field from a little boy, 12 years old, living in a town north of here, over which our airplanes fly very frequently. The letter is so fine and cheerful and so full of courage and inspiration that you may wish to publish it. If a little boy, handicapped as he is, can maintain such a bright outlook upon life, the knowledge of that fact and the spirit of the letter should encourage those who may be tempted to complain in these trying times. Okolona, Miss., September 3, 1918. I just want to write and tell you how much I enjoy your aviators. I am a paralyzed cripple boy and don’t have very much pleasure, but your fliers and their wonderful stunts give me more pleasure than anything in my life. I can sit in our front yard and see them all day. Won’t you please ask them to do all their wonders right where I can see them? I live in South Okolona in a two-story bungalow due south of the Baptist Church, and if they will fly straight north up that long road and street south of the Baptist Church my mamma has a twenty-acre field right by our house, and I don’t think she will care if they will light right in the corn. And, last, won’t you or your aviators drop me a letter in our yard some time? I have two brothers already in France and three more to go in the next draft but I will never be able to do anything but wave at you all and yell hurrah for Uncle Sam. I hope I haven’t troubled you by writing and pardon pencil, but I’m too shaky to use a pen. Love to you and all your aviators from WARDIE G. DAWSON. P.S. – I’m going to watch for letter to fall to me from now on. W.G.D. To Wardie G. Dawson, Okolona, Miss. Subject: Delivery of letter by airplane. 1. Your letter, my dear little friend, afforded me a great deal of pleasure, and I am glad to be able to oblige a fine young American like you, who has not the strength and health to be a soldier. You must not let your condition discourage you, for it is not only those who bear arms who will do their part in winning the war and achieving victory for freedom. Those who accept hardships with fortitude and can radiate happiness in spite of misfortune are the bravest sort of people, and it is brave men and women and boys and girls who have made our country what it is and who are going to keep it so. 2. I am glad to know that our fliers and their ships bring you joy, and I hope that you will be able to see them very frequently. I know that if our men realized that they were being watched and admired by such a fine little patriot and loyal friend it would be a source of inspiration to them and an additional incentive to do good work. 3. I don’t believe that it will be possible to have them land in your mother’s field if it is cultivated, for you know that ships must have a perfectly level, clear field in which to land successfully. Besides, we try very hard not to injure crops or anything else in the performance of our duties, for the country needs all its resources very badly and the soldiers must do everything in their power to conserve and increase them. 4. I am going to have one of our aviators drop this note to you, and also a copy of the Payne Field Zoom, and I want to tell you that both I and all the members of my command regard you as one of our true friends. 5. With five of your brothers in uniform, fighting for their country, and you at home doing your bit in the best way you can, Uncle Sam may well feel satisfied with the way the Dawson family has responded to the call, and the fact that far and wide throughout the land all Americans are rallying to the flag enables us all to look to the future with firm confidence and great hope. Lieutenant Colonel, J.M.A, A.S.A, U.S. Army. So far as we know, Colonel Heard kept his end of the bargain and delivered the letter to Wardie Dawson and, presumably Wardie in turn continued to enjoy the airships flying above his mother’s house in Okolona, the cornfield intact. In time, of course, the “War to End All Wars” ended and Payne Field closed. Today, nothing remains of Payne Field, with the exception of a hanger which was disassembled and sold to a company in nearby Tupelo. 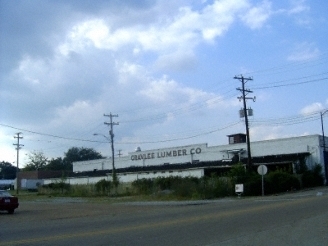 In 1934, the Gravlee Lumber Company (left) moved to Tupelo from Nettleton and took over the building and used the former hanger for storage. In 1945, Guy Justis Gravlee, Jr., returned from World War II to take over the family business. Interestingly, Gravlee was himself a decorated officer in the Army Air Corps, and was awarded the Distinguished Flying Cross for heroism and extraordinary achievement and the Air Medal with Nine Oak Leaf Clusters for service in Europe. After the war, he had a distinguished career with the Mississippi National Guard. In 1962, Gravlee was in command of the National Guards troops dispatched by President Kennedy in response to the rioting at Ole Miss* and commanded the National Guard activities following Hurricane Camille in 1969. No doubt, Gravlee, as an airman himself, appreciated the history of the former Payne Field hanger. Major General Gravlee died after a lengthy illness in December, 2010. After Payne Field closed, Colonel Jack Heard moved on to other fields of endeavor. 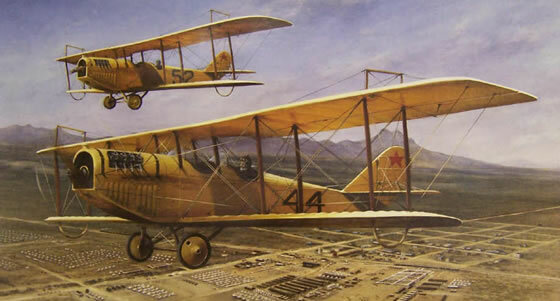 After organizing the Flying Circus (the forerunner of the Thunderbirds) in 1919, Heard went back to the cavalry and then transitioned into mechanized cavalry, ultimately commanding the 5th Armored Division. A man of varied interests, including coin and stamp collecting, astronomy, rose culture, history and finance, he retired in 1946 as a Major General and died at Brooke Army Hospital in 1976. Back in Okolona, Wardie G. Dawson, the little boy who wrote the letter, died in 1961 at age 55 and is buried in Okolona’s Oddfellow Cemetery near one of his brothers, Jesse Howard, who served in WWI. 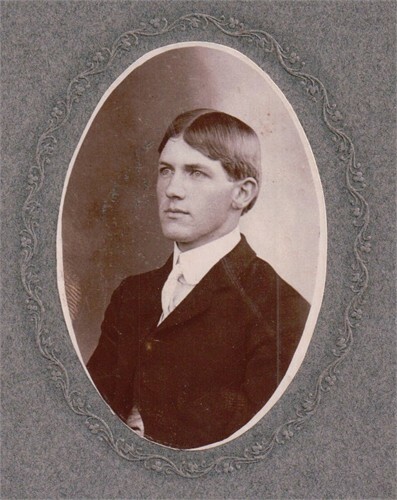 According to an obituary published at the time of his death, Ward Dawson "held various odd jobs and was widely known for his thoroughness in distributing advertising material. He was a big booster for Okolona and met visitors and newcomers with cheerful greetings and [a] cordial welcome." * One of the National Guardsmen dispatched to Ole Miss under Gravlee’s command was my father-in-law, Rayford Williams of New Albany, Mississippi. Another superb write-up, my friend! This is a fascinating history, of which I knew nothing. Thank you for sharing it! Dr. Morris and "The Little Red School House"